The bishop directs the work of salvation in the ward, which includes temple and family history work. The bishop and his counselors set an example for ward members by teaching the doctrine of temple and family history work and testifying of the blessings that can come from this work. They position the high priests group leader as the coordinator of the ward council‘s temple and family history work in the ward. Below is an example of how family history is organized at the ward level. The ward council uses temple and family history work to bring joy and spiritual growth to those they serve. Temple and family history work can help the ward council in the many aspects of the work of salvation. Members of the ward council develop a plan to help individuals build testimonies, receive saving ordinances, keep covenants, and become consecrated followers of Christ (see Moroni 6:4–5). 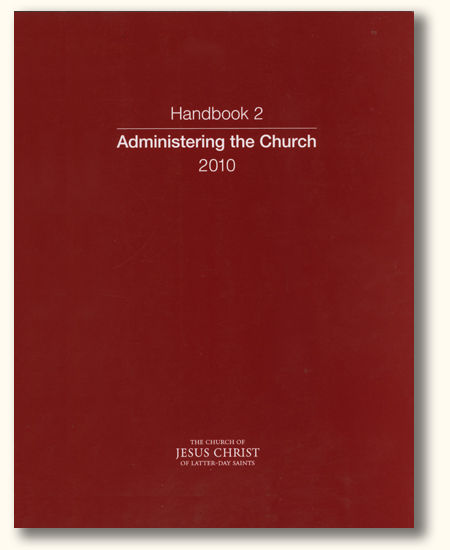 The work of salvation includes member missionary work, convert retention, activation, temple and family history work, and teaching the gospel (see chapter 5 of Handbook 2: Administering the Church). Family history allows Church members to share a gospel topic in a nonthreaten-ing way. Most people have a natural interest in families. The hearts of millions of people have turned to their ancestors. … The ward mission leader works closely with full-time missionaries, ward missionaries, and the ward council in considering other means of using family history in missionary work (see Preach My Gospel, 163–165). Temple and family history work is an effective way to aid new-member retention. The family history consultant or the home teacher or visiting teacher establishes friendships by assisting new members with their family history. 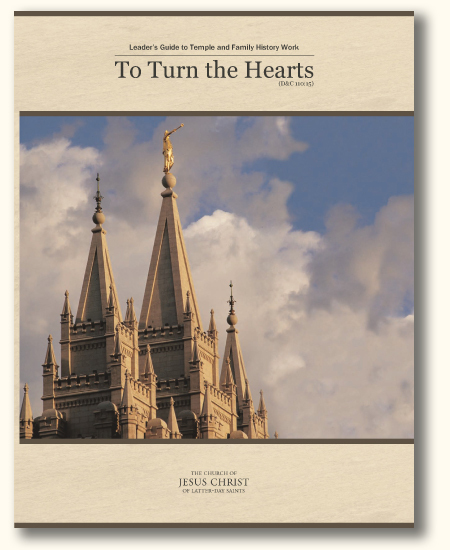 New members can be ― nourished by the word of God (Moroni 6:4) when they receive the Member’s Guide to Temple and Family History Work, attend a family history class, learn the doctrine of temple and family history work, and experience the joy of doing temple work for their ancestors. The new member is given opportunities to serve by obtaining a limited-use recommend and performing baptisms for the dead or participating in FamilySearch indexing. As ward council members prayerfully identify less-active members who are most likely to return to activity, they assign dedicated home teachers and visiting teachers to minister to them. These home teachers and visiting teachers, with the assistance of family history consultants, can use temple and family history work to “be the means of bringing salvation unto them” (3 Nephi 18:32). 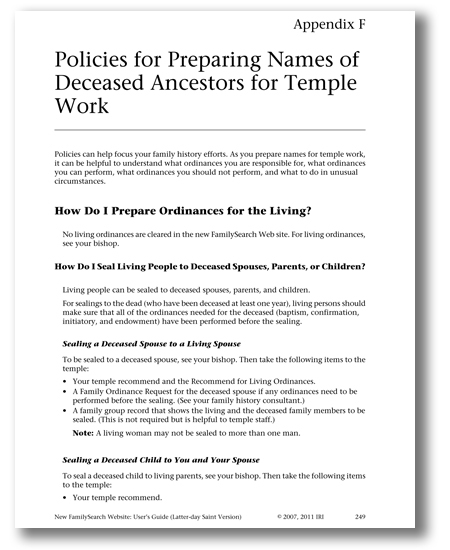 As their hearts are turned to their deceased relatives in need of ordinances, they will be motivated to obtain a current temple recommend and go to the temple. 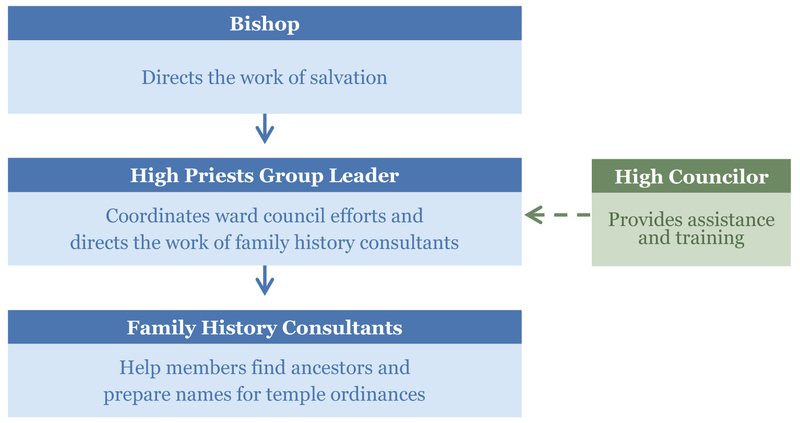 Under the direction of the bishop, the ward council discusses and develops a plan to encourage members to participate more fully in temple and family history work. The high priests group leader coordinates the efforts to determine specific ways that the work can strengthen all members — adults, youth, and children. The ward council assists the bishop in ensuring that the doctrines, principles, and blessings related to family history and temple work are taught regularly in ward meetings. They encourage members to receive their own temple ordinances and actively participate in family history and temple work. Each family can receive the Member’s Guide to Temple and Family History Work to use in the home and in conjunction with family history classes offered. Holding a family history class is a good way to increase participation and interest in family history. The class can also be used as a tool for activation, retention, and missionary efforts. Anyone, including those determined by the ward council, can be invited to attend the class. The class is taught by an effective instructor who may or may not be a family history consultant. The class may be taught during Sunday School or at another time that is more convenient for members. It is taught under the direction of the bishopric rather than the Sunday School president. Lessons are generally conducted as workshops in which members actually complete their own family history work, either on the computer or on paper. Where feasible, class participants should have access to computers. Many meetinghouses are currently being equipped with wireless Internet. Consultants can assist instructors as needed by providing personal help to participants during the class as well as after the class in members‘ homes or family history centers. Resources available for the class include the Instructor’s Guide to Temple and Family History Work and accompanying Temple and Family History Course DVD and the Member’s Guide to Temple and Family History Work. The Church has created an excellent site to give you the family history & temple work training you need as a priesthood leader. Please visit The Training & Resource Site for Priesthood Leaders. That’s it. Congratulations! You’ve now met all the criteria of a fully trained priesthood leader. Don’t you feel great? P.S. — Here are some great ideas for Youth and Family History.